The Sochi Olympics start in 199 days, but many countries have already released their preliminary rosters for their men's hockey teams. We want you to vote on who has the best players at each position. Which countries boast top goalies? Defence? Forwards? With 199 days to go until the opening of the Sochi Olympics, the hockey federations of many countries have released their preliminary rosters for their men's teams ahead of their orientation camps. While cuts will inevitably need to be made, the case can be made for each team's strengths and weaknesses, especially by position. Below are the teams that have announced their early rosters, and highlights of what they boast at each position. From there, it's your call to pick which nation has the edge. Vote now and have your say! Canada: Roberto Luongo captured gold in 2010 on home ice, and he's the early favourite to repeat as the starter, with Carey Price and Mike Smith giving him a challenge. Finland: Tuukka Rask took his Bruins to the Stanley Cup final in 2013, stepping in after the departure of Tim Thomas. Rask may do the same for usual Finnish netminder Miikka Kiprusoff. However, Pekka Rinne and Kari Lehtonen make a good case for the job as well. Russia: Evgeni Nabokov returns to the fold after Russia's disappointing ouster in 2010, but it may be Sergei Bobrovsky's job to lose after his spectacular season with the Columbus Blue Jackets earned him the Vezina Trophy. Sweden: Another former Vezina winner and 2006 Olympic gold medallist, Henrik Lundqvist, seems like a lock as Sweden's starter, with Robin Lehner and Jhonas Enroth looking for the backup role. United States: Ryan Miller returns to camp with the Americans, but he may not be the favourite with 2012 Conn Smythe Trophy winner Jonathan Quick and the stingy Craig Anderson also on the list to wear the red, white, and blue. Canada: The 2010 gold medal squad is largely intact, with Duncan Keith, Brent Seabrook, Shea Weber, and Drew Doughty returning. Add possible offensive threats Kris Letang and P.K. Subban and you've got a marquee blue-line corps. Finland: Of the 14 selected to attend camp, only five of the Finnish defenceman have NHL experience, including Joni Pitkanen, Kimmo Timonen and Sami Salo. Russia: The Russian back end seems to be getting a bit long in the tooth, with Sergei Gonchar, Andrei Markov and Anton Volchenkov being the most notable of the defenceman on the shortlist. Sweden: They boast a mix of size and skill with Nicklas Kronwall, Erik Karlsson, Jonas Brodin and Alex Edler among the invitees. United States: The Americans' list features shut-down defenders like Ryan McDonagh, Brooks Orpik and Zach Bogosian, but they also have the speed to pinch in and make a difference at the other end of the ice with Jake Gardiner, Cam Fowler and John Carlson also at camp. Let's get straight to the point and list the (in our opinion) top six players for each nation. Canada: Sidney Crosby, Jonathan Toews, Steven Stamkos, Claude Giroux, John Tavares, Rick Nash. Finland: Mikko and Saku Koivu, Teemu Selanne, Olli Jokinen, Valterri Filppula, Lauri Korpikoski. Russia: Pavel Datsyuk, Evgeni Malkin, Alex Ovechkin, Ilya Kovalchuk, Alex Semin, Alex Radulov. 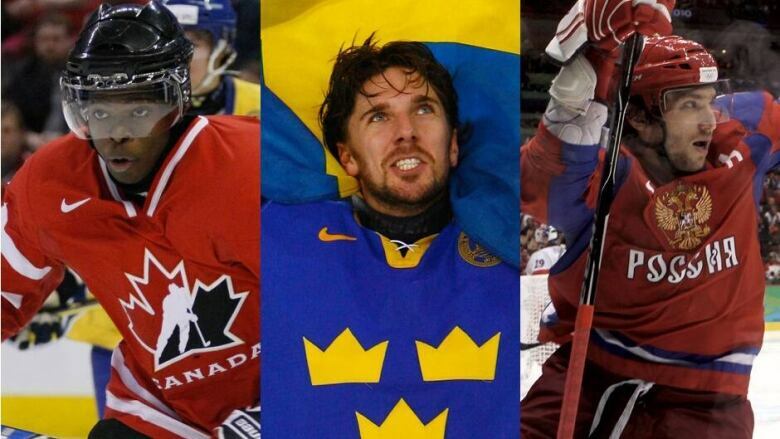 Sweden: Henrik and Daniel Sedin, Henrik Zetterberg, Nicklas Backstrom, Loui Eriksson, Johan Franzen. U.S.: Zach Parise, Patrick Kane, Phil Kessel, Ryan Kesler, Ryan Callahan, Bobby Ryan.